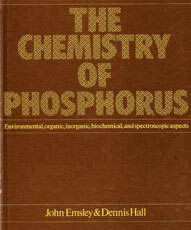 The Chemistry of Phosphorus was written with Dennis Hall, who wrote the organic phosphorus chapters, while I wrote the inorganic phosphorus chapters and the introduction. It covers all aspects of this element within a single volume. The emphasis is on mechanism, structure and bonding with the various theories explained. The book also deals with the role of ATP in the living cell, the geochemistry of phosphates, the use of phosphorus derivatives in agriculture and industry, and their misuse in warfare as nerve gases. The book is fully referenced and includes problem and answer sections. The idea for this book came about when I and my co-author, Dennis Hall, were travelling to watch a rugby match at Twickenham on 13 October 1973 (Result: England 19, Japan 10). He was an organo-phosphorus chemist, and I was an inorganic phosphorus chemist and we were both in the same department of chemistry at King's College London. We drew up an outline for the book and submitted it to publishers Harper & Row whose offices were nearby. They commissioned the book which eventually was marketed at the then incredible price of £22 (equivalent to £200 today). Nevertheless, it sold well and was the standard reference work for many years.